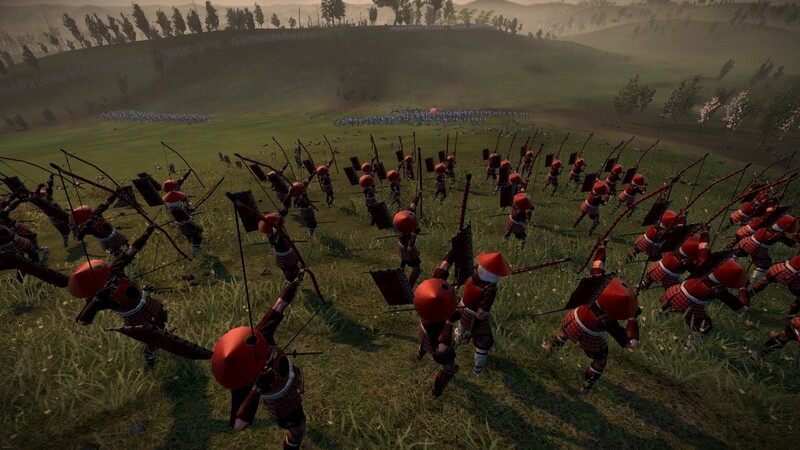 … and the enemy spearmen resort to charging uphill under a shower of arrows. I win. In the south, Nobukado runs into a little more trouble. 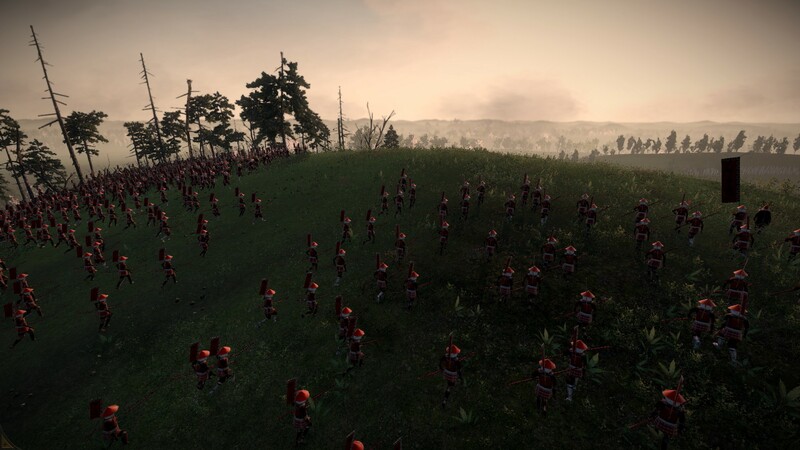 The battle starts off much the same way: I occupy a hill, and my archers start skirmishing with theirs. 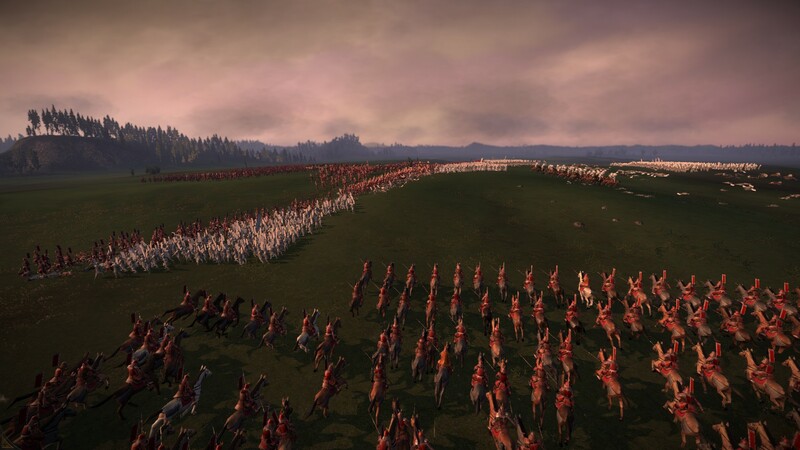 But when I move a squadron of cavalry up to harry the enemy bowmen, their entire army surges forward into melee. Assailed by enemy samurai, the right wing of my army almost breaks; my horsemen sacrifice themselves in a last-ditch charge. Luckily, the enemy general falls just in time, and the left wing of my army manages to break through. That does for the Satomi. 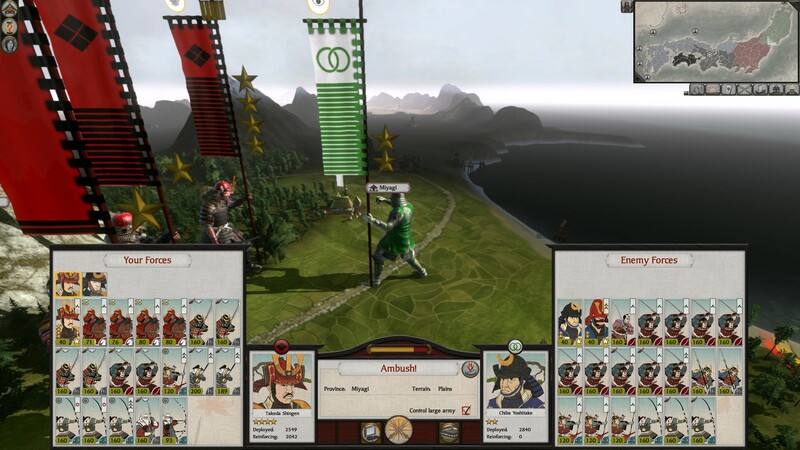 Their Satake allies last a little longer; after mustering another army, they slip past Nobukado and briefly recapture the province of Musashi. 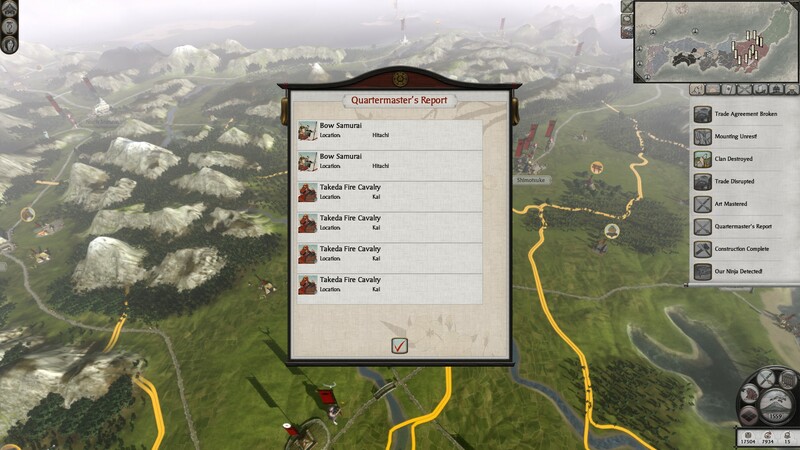 In response, the Takeda brothers join up, and wipe out the enemy army while it’s trapped behind castle walls. An epic showdown? Nah. 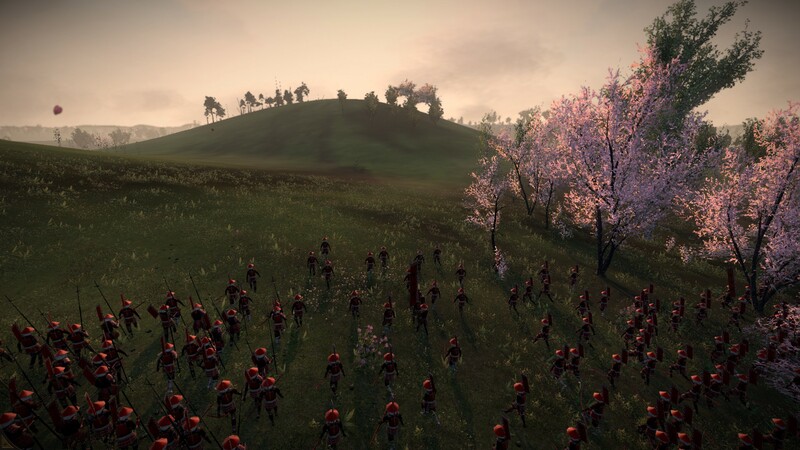 Storming fortresses in Shogun 2 is a meat grinder… if you fight it out. Instead, I take advantage of the auto-resolve, which tends to short-change castle defenders. 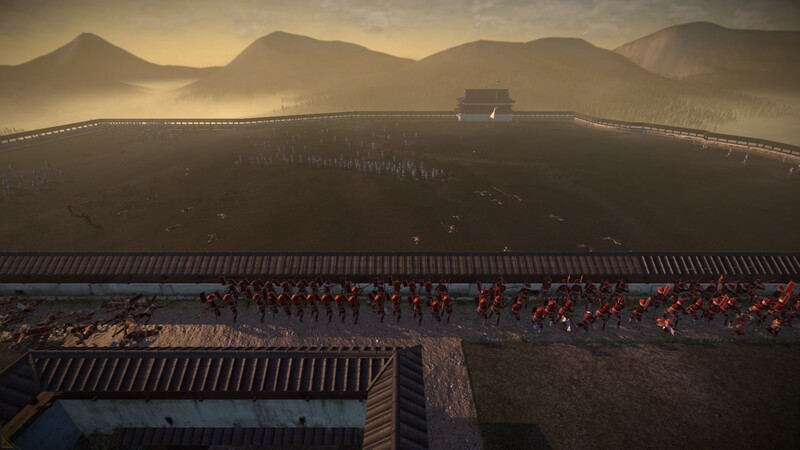 I see two river crossings; my main army defends the nearest, while a small detachment secures the further one. The battle starts. And with their superior numbers, the Uesugi come perilously close to breaking my line. I recall the distant detachment, which makes its way across the river and hits the Uesugi from behind. Slowly, painfully, my troops gain the upper hand. 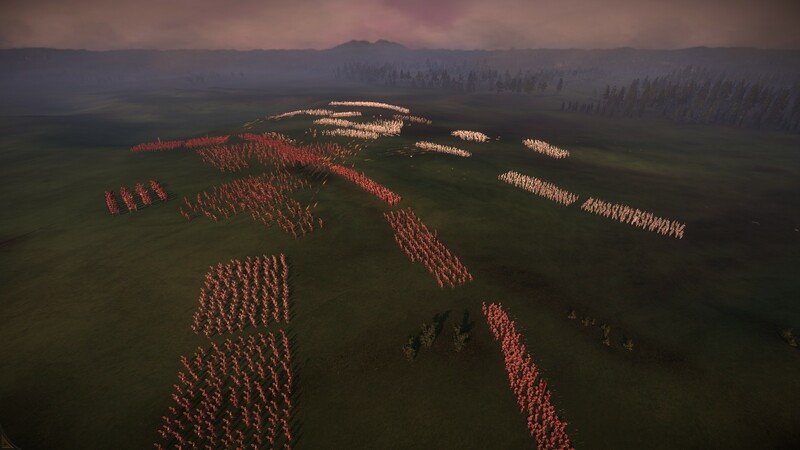 Then, as Uesugi soldiers appear on my flank, I realise that there was a third crossing. If the Uesugi had taken that third crossing earlier, I think they would have won. 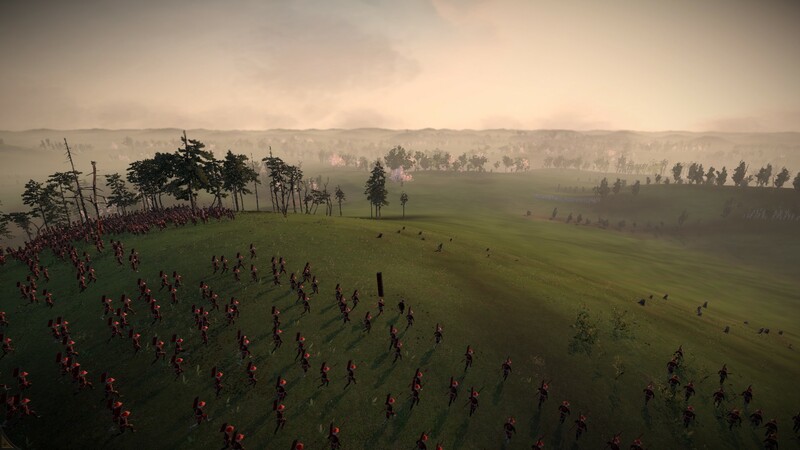 As is, I order my general away from the Uesugi spears just in time; and I pull a few detachments back from the melee at the main crossing to deal with the new threat. Somehow, my soldiers pull it off. 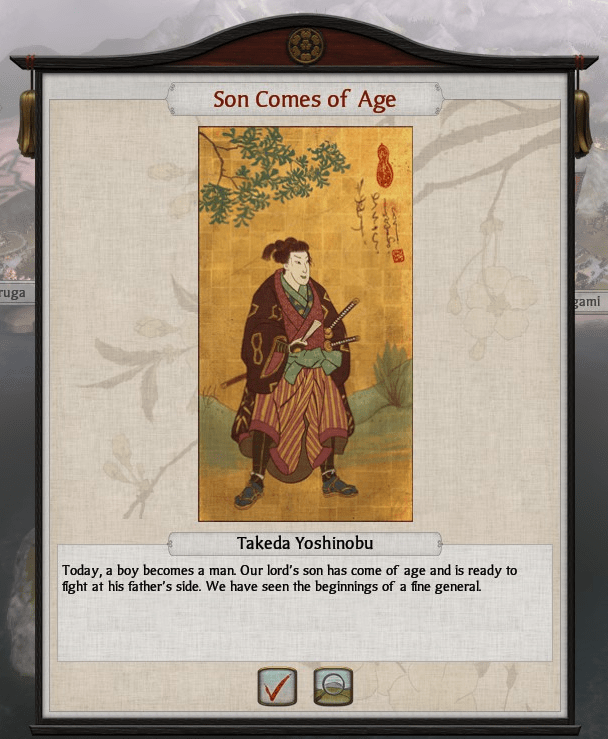 When the dust settles, the Uesugi’s final army has been destroyed. 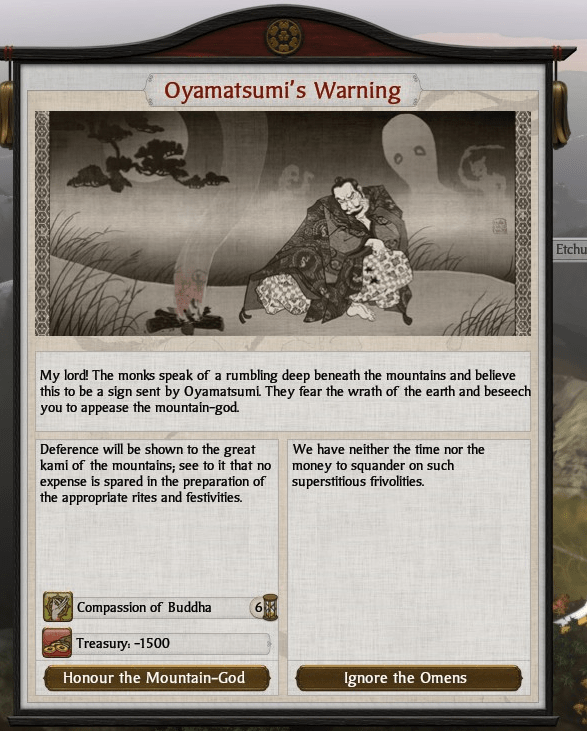 After that, the fall of the Uesugi is an anticlimax. 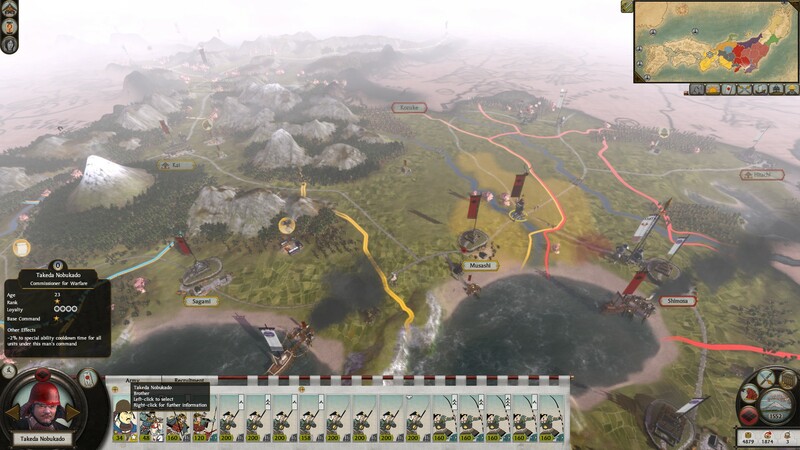 The three Takeda brothers race through the now-undefended Uesugi lands, and 40 turns into the game, in 1554, I seize the last Uesugi stronghold. 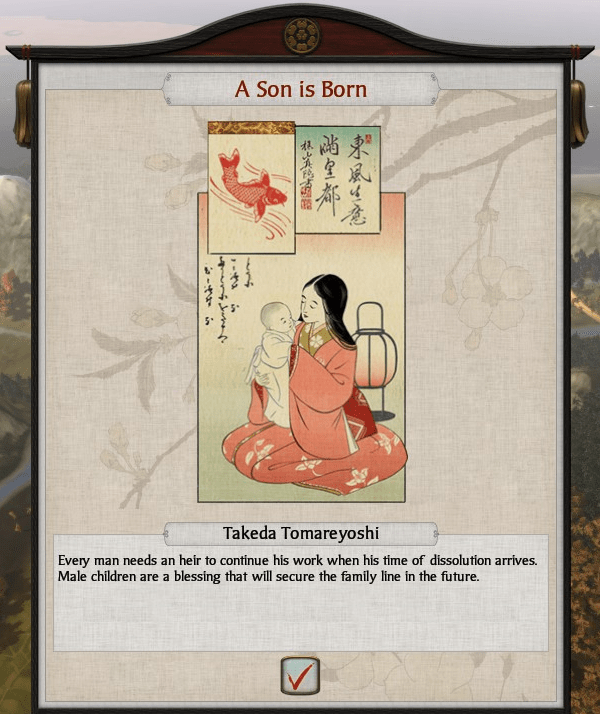 (To cap off the good news, around this time, Shingen’s wife Kanako gives birth to a baby girl.) At this point, I finally remember to turn the battle difficulty down from “hard” to “normal”. This is about as far as I can expand before triggering realm divide. It’s time to dig in, consolidate, and prepare for the final showdown. And for that, I have a secret weapon: the spreadsheet. 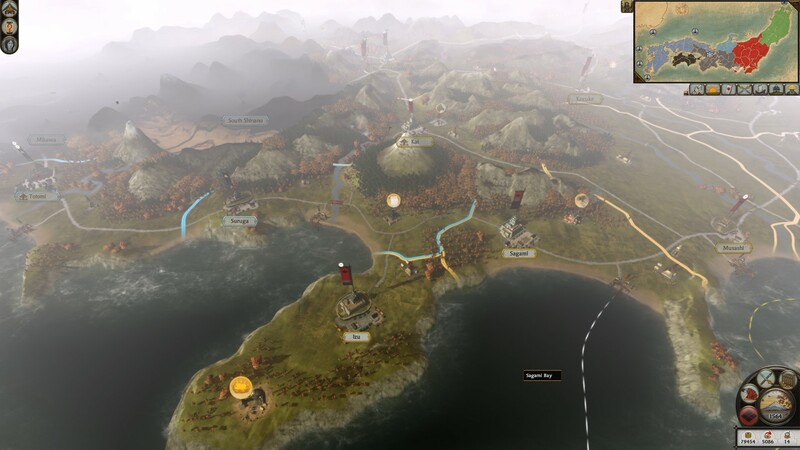 My starting point is this handy map (credit goes to “TinCow” at TotalWar.org; the original is available here). I have circled my territories in red: Echigo in the north, down to Izu in the southwest, and then across to Fukushima in the east. Echigo blocks off attacks along the northern coast. There is a corridor from the north coast, through Hida, to North Shinano. There is a western corridor running from central Japan through South Shinano and thence onto North Shinano. 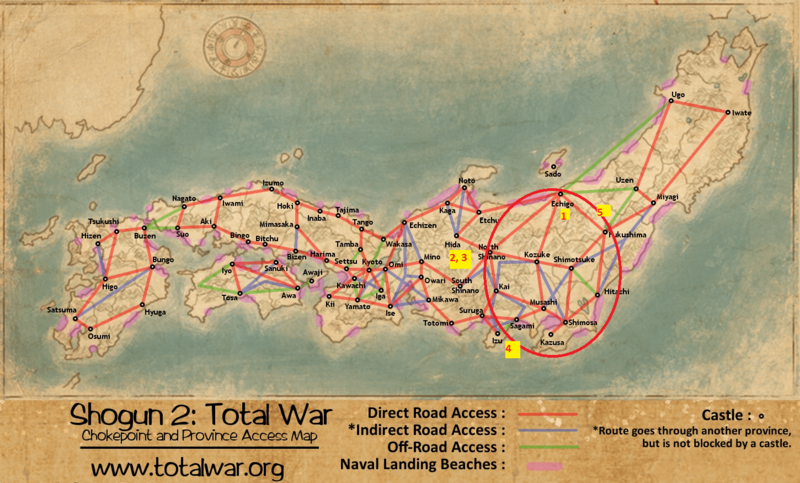 Along the south coast, an army can move west from Suruga against Izu or Sagami. Finally, an army marching against me from the east will have to take the long way through Echigo (1, above), or the direct way through Fukushima. All up, my current income will just about support two deluxe armies and five garrison armies, even after trade is cut off by realm divide. Good! 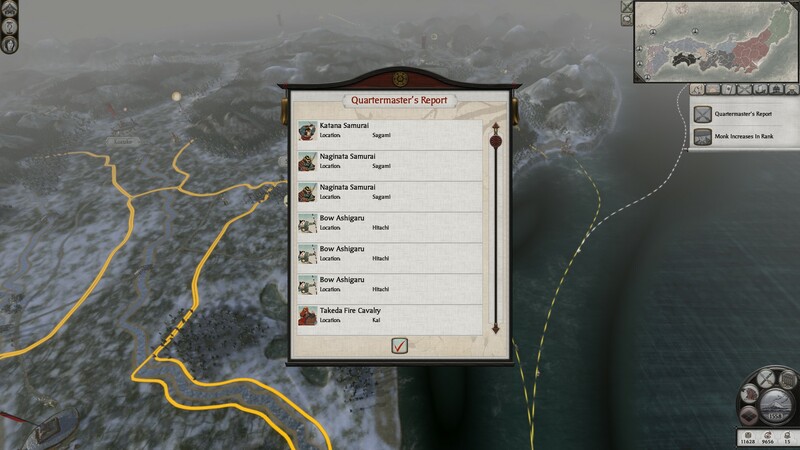 My recent conquests give me access to several bonuses: an armourer in Suruga province, a bonus to archers in Hitachi province, and the cavalry bonus in my starting province, Kai. 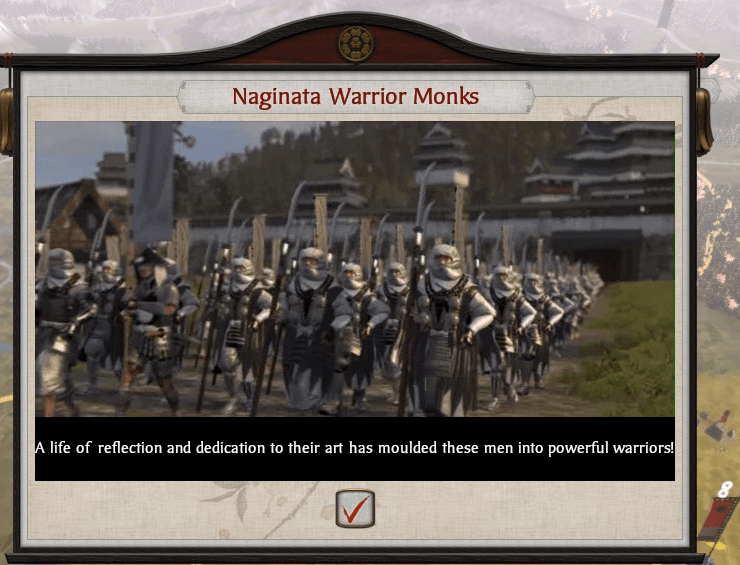 Of these, the single most impressive is the armourer in Suruga; after I upgrade it, it gives all locally trained infantry units +3 to their armour. 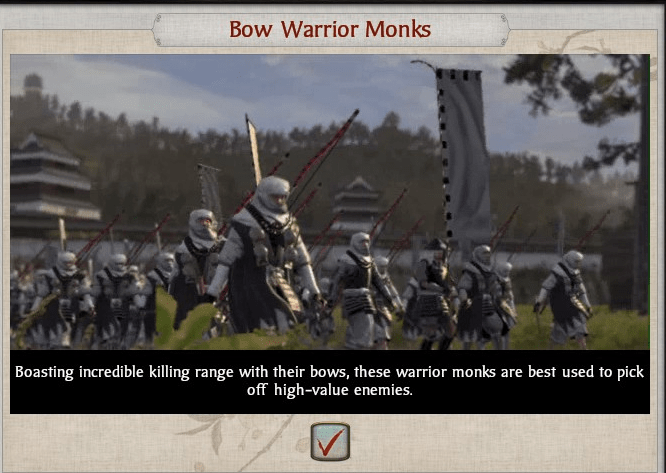 A basic ashigaru unit has 2 armour; a basic samurai has 5-7. 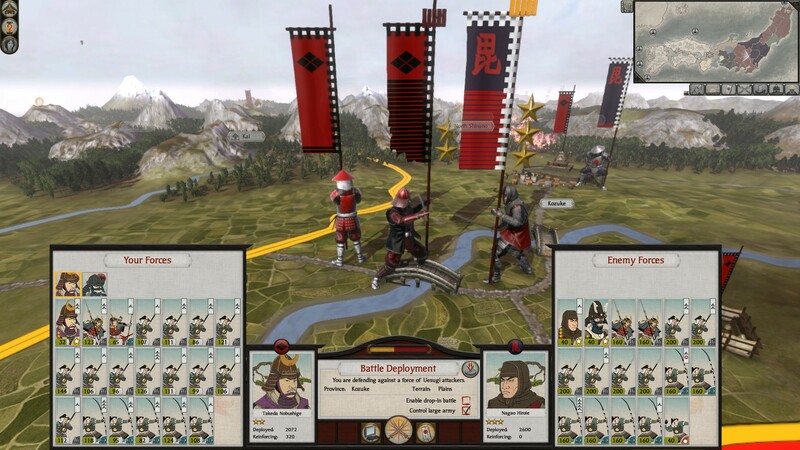 That means that ashigaru trained in Suruga will have 5 armour (2 plus 3) — equal to a samurai. 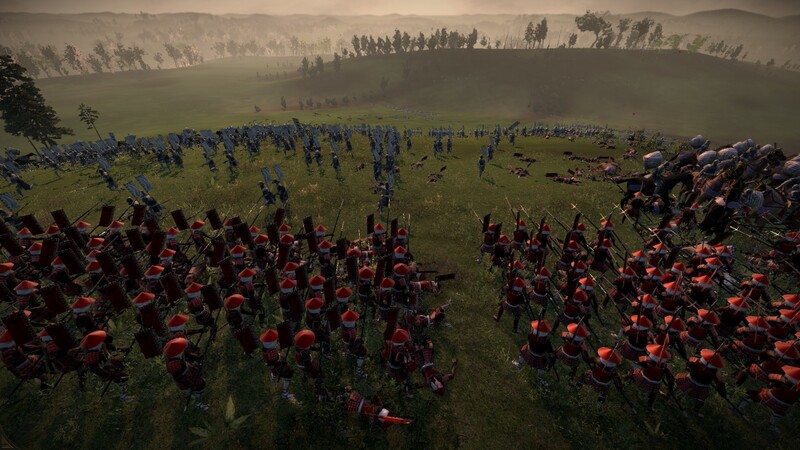 I take advantage of the bonuses to train a few new regiments. Not too many — in time, I’ll unlock even more bonuses. In 1556, my buildup is briefly interrupted; my smaller neighbour to the east, the Mogami clan, decides it can do better than the last three clans that picked a fight with me. Not wishing to trigger realm divide, I refrain from the offensive. 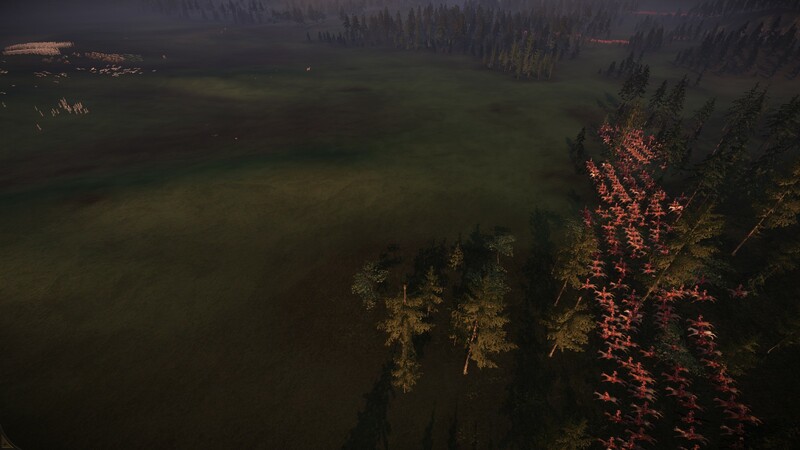 Instead, I reinforce my border fortresses and let the Mogami stomp around the countryside. 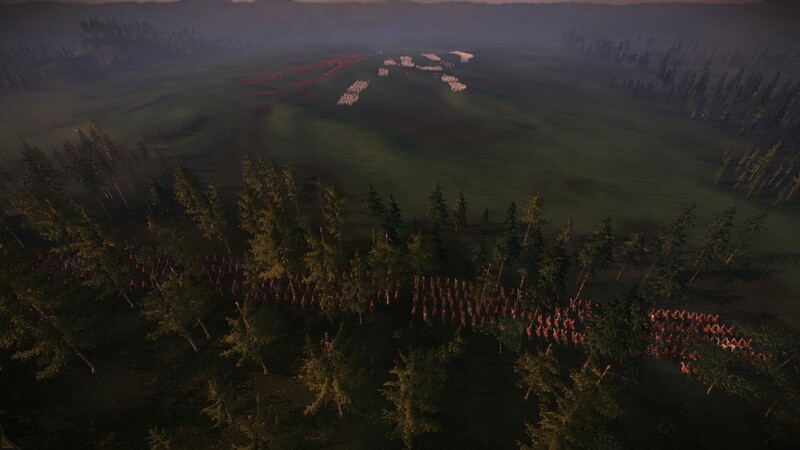 Eventually, the Mogami fall into my trap: they move up a second army and assault the castle defended by Takeda Nobukado1. With both their armies wiped out, the Mogami are quick to accept my proposed cease-fire. Soon afterwards, their neighbours, the Hatakeyama clan, gobble them up. Now left in peace, I resume my buildup. I recruit new, ever more lethal units. 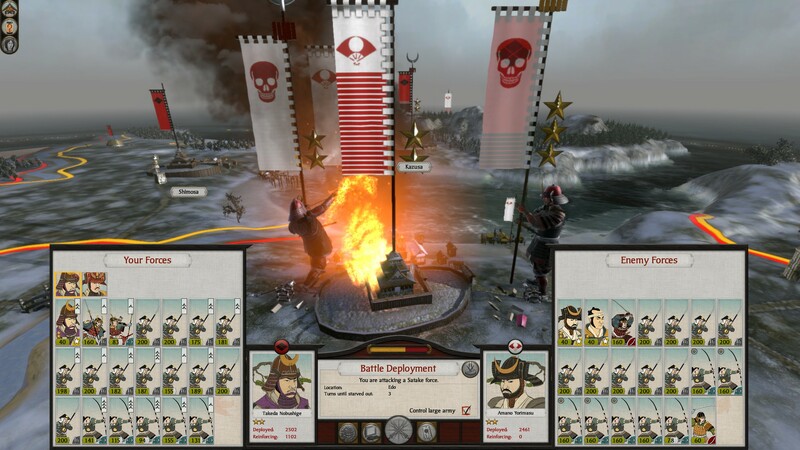 Some are new unit types, such as warrior monks and the unique Takeda unit, fire cavalry. 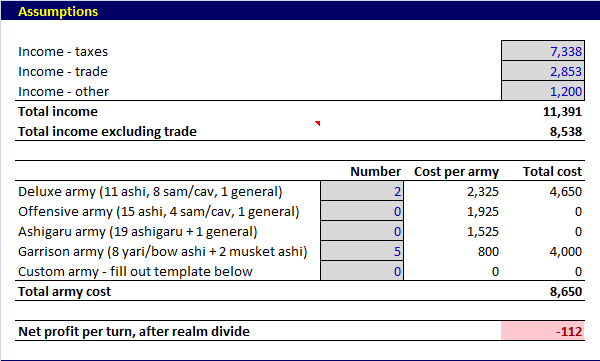 Others are old staples such as ashigaru, heaped with bonus after bonus. The Takeda domain flourishes — note my income, bottom right. 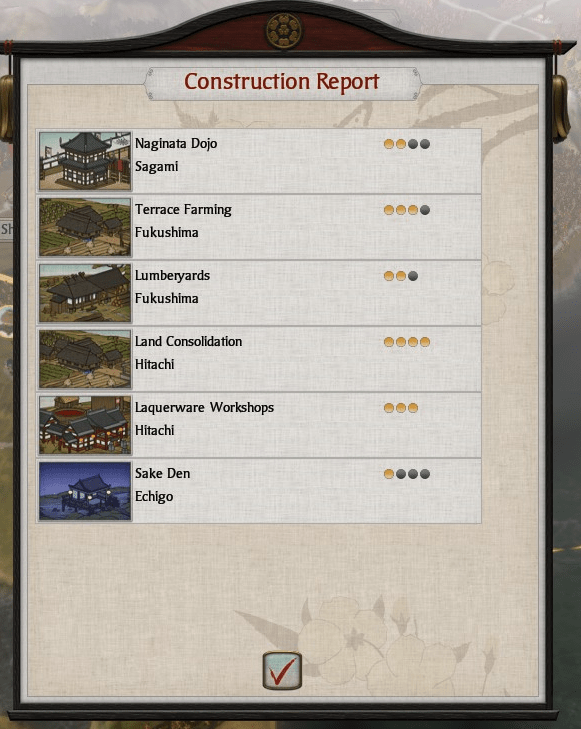 And this is after splurging on heavy cavalry and samurai. During this time, a handful of behemoths consolidate their control over Japan: the Otomo (blue, to the west), the Imagawa (grey, centre-south), the Jinbo (lighter blue, centre-north), me (red, east), and the Hatakeyama (green, far east). 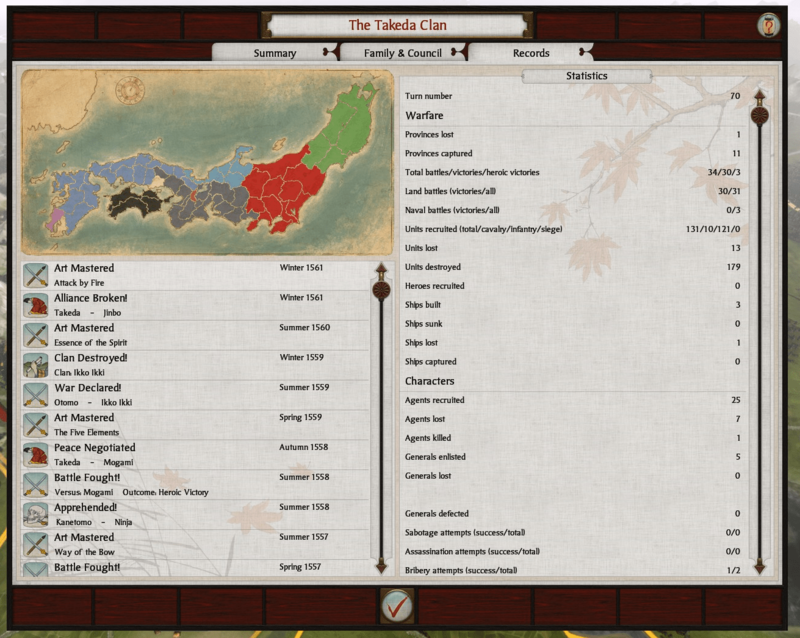 I have alliances with all three of the western clans: Otomo, Imagawa, and Jinbo. The Otomo are clearly at fault here. 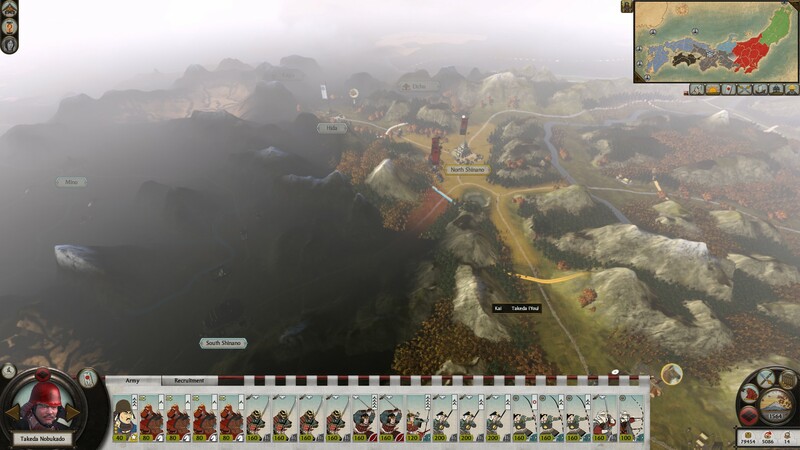 They are also the more dangerous of the two clans, and the Jinbo are sitting on top of one of my victory provinces. 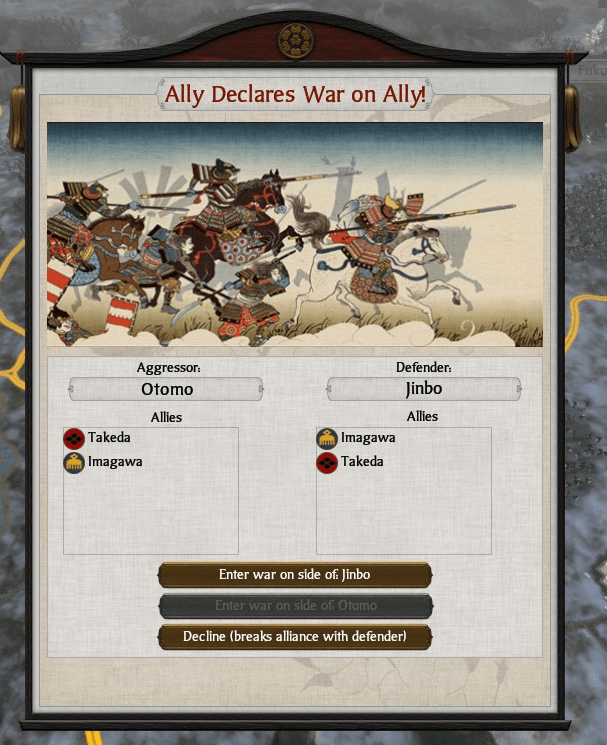 I will need to break my alliances with the Jinbo and Imagawa anyway, in order to win… and this gives me an excuse. I bid the Jinbo farewell. By now, my army is up to its target strength: two full, elite stacks, plus garrisons in every border province. In fact, my my economy is doing so well that my army is a little bit above its target strength. There seems little need for a further buildup. And the clock is ticking; sooner or later, I’ll have to march to war again. 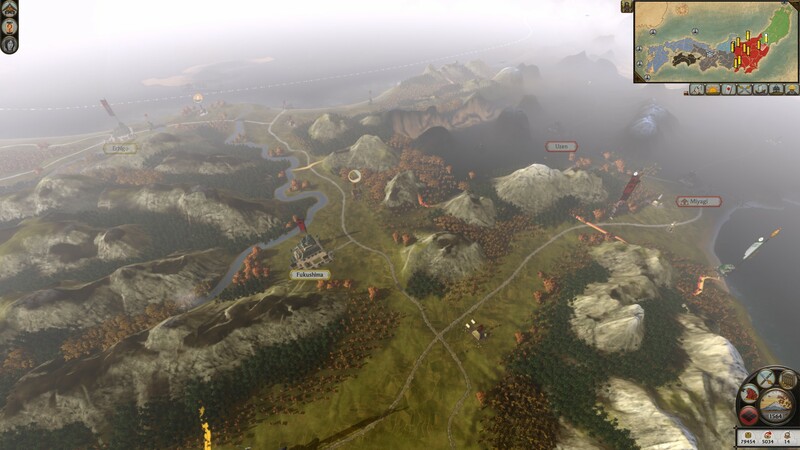 … while my cavalry hides in the forest a little further away. In the end, the anvil does pretty well on its own. 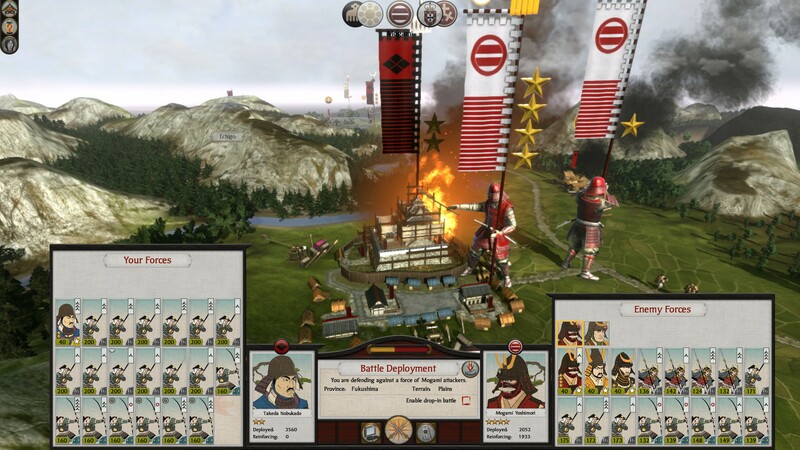 My troops have so many bonuses, even the humble ashigaru can hold off the enemy samurai. The enemy army disintegrates. 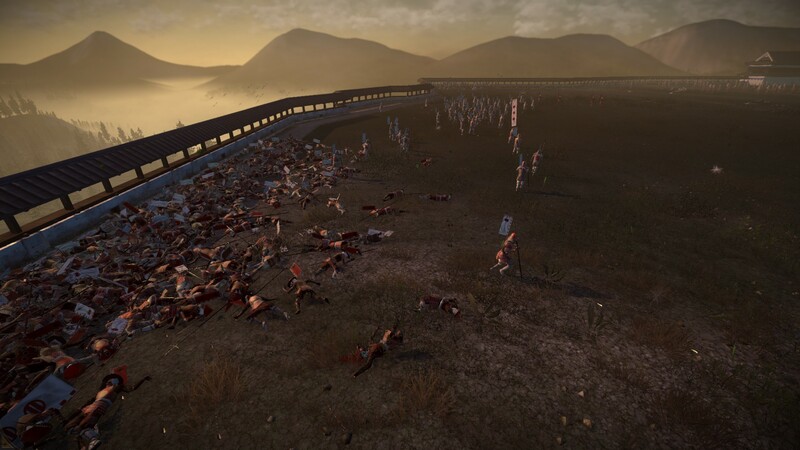 Entire lines crumple as the horsemen punch through; and the battlefield becomes a sea of Takeda red, enveloping the fleeing Hatakeyama. My “dream army” has passed its first test with flying colours. As I survey the aftermath, I note that it’s turn 79, or 1565 — two-thirds through the campaign. I have forty turns left to win the game. Given my flourishing economy and vast, well-equipped army, I’m confident I can do it. In the west, Takeda Nobukado has another super-stack poised to march west the moment realm divide begins. 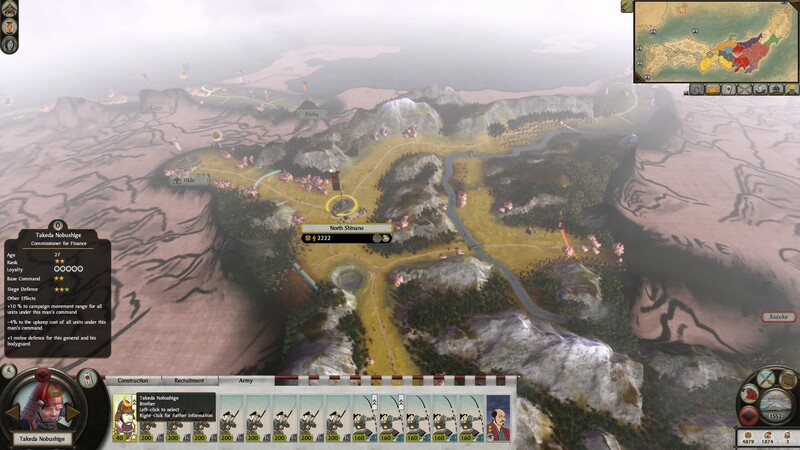 The partial stacks nearby can reinforce Nobukado, hold North Shinano, or pick off an undefended province. If you’d like to play along, here are my saved games (1) at the start of part 2/end of part 1, (2) after my defeat of the Uesugi, and (3) at the end of part 2. Here is the upkeep calculator I created. Input your income and desired army composition into the grey cells, and it will estimate your net cashflow per turn after realm divide. Note that I made it specifically for the Takeda, who receive cheaper cavalry as their bonus.